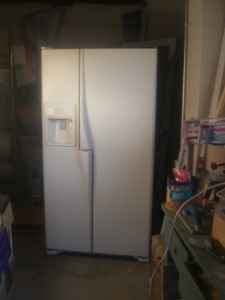 theAd>> Nearly new Maytag refrigerator. Unique wide by side design allows for wider items in both freezer and refrigeraot. 26.8 cubic feet in volume; Width 35 3/4 inches; Depth 33 1/2 inches. Water and ice in door. WOW! Someone eats WAY more biscuits than I do. You may want to even consider it a problem if you need a whole fridge for them. Mine fit in the regular fridge with the other items. It is good there is Ice water in the door. Sometimes biscuits are dry. Cold milk in the door would be better and maybe hot gravy. Yeah. I don't want your silly biscuit fridge unless it has a gravy dispenser. I know I am glad I held out for the nacho cheese pump on my chip silo.